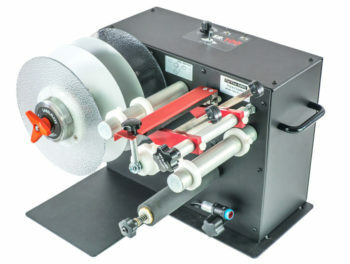 The SR-6 or SR-10 combination Label Slitter & Rewinder allows you to slit and rewind in-line directly from a printer without placing any tension whatsoever on the printer. A free-hanging loop of material is created between the SR-6 or the SR-10 and the printer thereby eliminating all tension on the printer. A special chassis-mounted optical sensor on the SR-6 or the SR-10 starts and stops the slit/rewind action based on the optimum depth of the loop. Fully adjustable tension on the SR-6/SR-10 provides complete control over the slitting action and the tightness of the finished rolls. Find more about the new SR-6 and SR-10 !